Sufiya Ahmed is an award winning author and public speaker on girls’ rights. 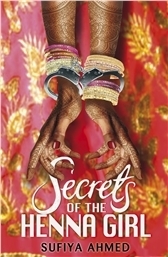 Her debut, Secrets of the Henna Girl, is fantastic and heart-wrenching in equal measure. I read it first a few years ago when it was shortlisted for the North East Teenage Book Award. Zeba Khan is like any other sixteen-year-old girl: enjoying herself, waiting for exam results... and dreaming of the day she'll meet her one true love. Except her parents have other plans. In Pakistan for the summer, Zeba's world is shattered. Her future is threatened by an unthinkable - and forced - duty to protect her father's honour. It's UKYA and it's a well known fact that all UKYA is awesome. Zeba's story is hard hitting while being sensitively handled. It will break your heart. If you need a good cry you will get one so get the tissues ready. The author's passion for girls' rights comes through in the writing and it is excellent. You can see Sufiya Ahmed at YA Shot 2018 on Saturday 14th April! She'll be chairing a panel about how relationships shape women’s lives, something about which she is intensely passionate.